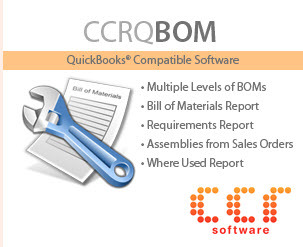 There are many improved and new features in QuickBooks 2011. Intuit has not provided anyone with a comprehensive list of all of the changes. I’ve been covering the major ones, but there are many smaller changes that are scattered about. Although they may be small, they could have a large impact on how you use QuickBooks. Here is a collection of the smaller changes that I’ve come across – some that Intuit pointed out to me, some that other reviewers and documenters have shared with me, and some I’ve found on my own. There are probably many more than what I list here (and have listed in my earlier articles on the 2011 release). I really wish that Intuit would give us a comprehensive list of ALL changes. If you find another difference in the new product that I’ve not discussed yet, please leave a comment! 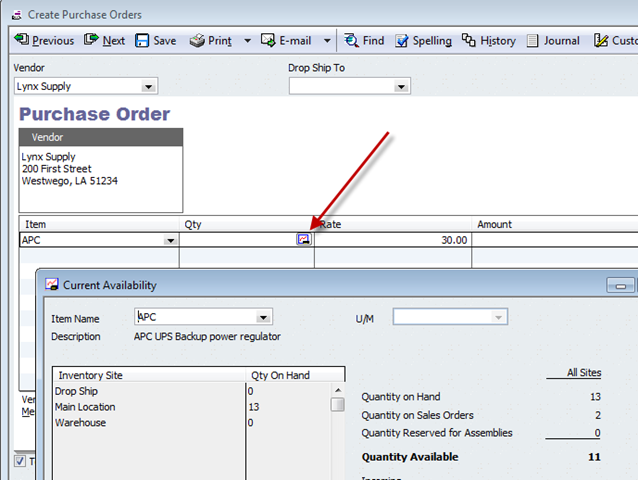 When entering a quantity on a purchase order we now have the availability icon in Enterprise (not in Pro or Premier), which lets you see information on the status of the item you are ordering. We’ve had this in sales orders and invoices, but now it is added to purchase orders. A nice addition. 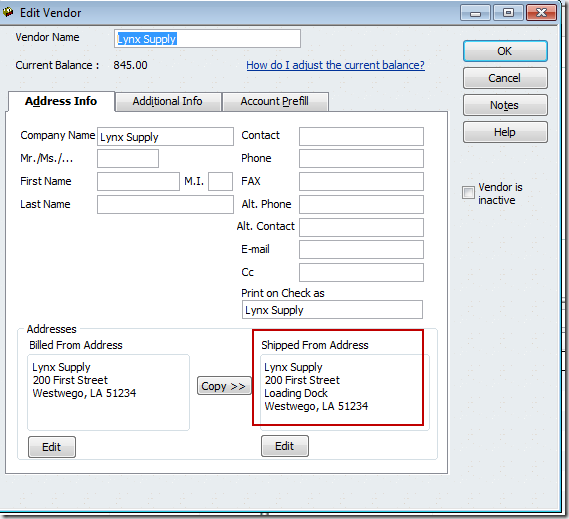 The vendor record now has a second address block, which has been requested often in the past. Prior to this release we only had one address, which showed up in PO’s and checks, etc. The Shipped From Address will print on a purchase order. The Billed From Address will be used in the check. We all know about the Live Community feature in QuickBooks, to help us get help online. This lets you access the Intuit Community Forums to get help from other users like yourself (or someone like me, who likes to hang out there and answer questions). On one hand, I am a great supporter of the Intuit Community Forums. On the other hand, I don’t like how Live Community works, because people don’t understand how it is working. Questions asked there get stuck in odd places, and people don’t realize that it is a User to User help forum. 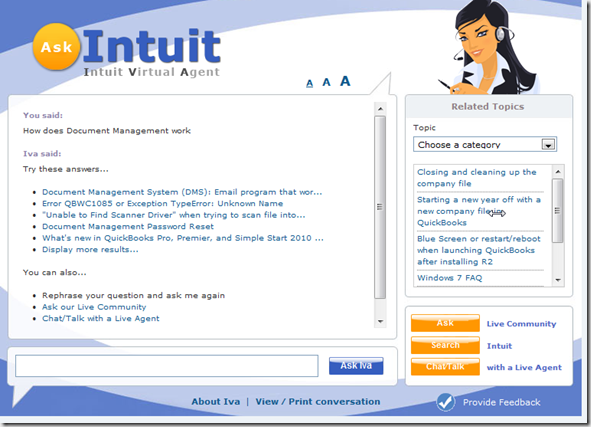 Now we have another option in the Help menu, the Intuit Virtual Agent, or “Ask IVA”. 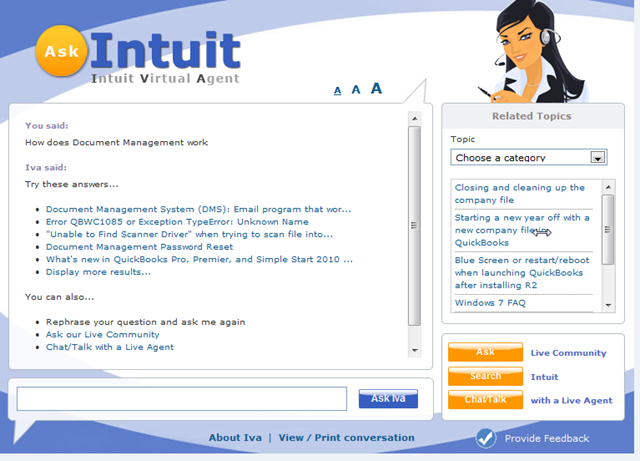 This opens a web browser and takes you to an “Intuit Interactive Agent”, which is a computerized help system. At this time I don’t know how well it will work. Some features may be limited to ProAdvisors, or may be found only in the Accountant’s Edition. Also note that “create backup” and “create copy” are there instead of Save Copy or Backup. Create Copy will let you create a backup, portable or accountant’s copy. Create backup goes straight to the backup window. QuickBooks 2011 adds the ability to edit your individual spelling dictionary. You will see a list of the words that you have added, and can mark them to be deleted. 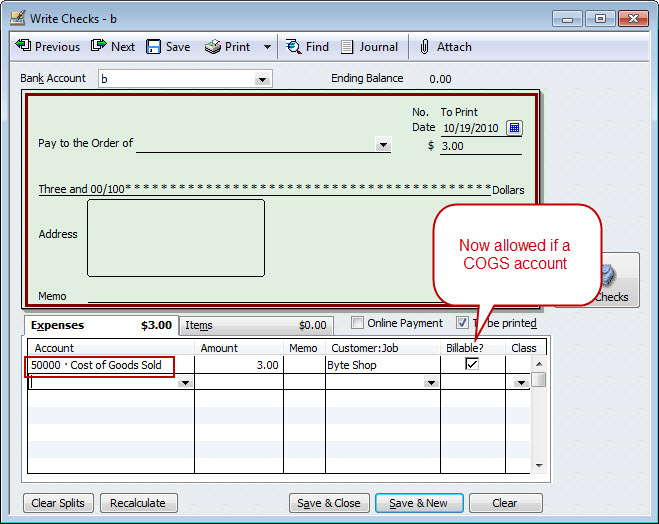 If you are writing a check, you have the option of using the Expenses tab or the Items tab. If you use the expenses tab you select an account to post to, and you can assign the amount to a customer and mark it as billable. But wait – if you select a expense account you can mark the line as billable, but if you select a COGS account you cannot mark it as billable. I’m not a CPA so I can’t say if this made sense or not, but from where I stand that seemed to be a bug. 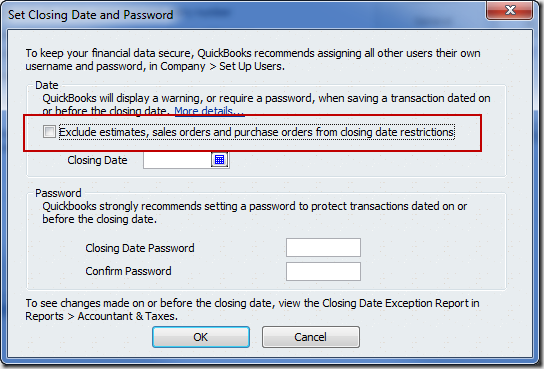 Intuit must have agreed – this has been changed in QuickBooks 2011. You can mark a COGS account as being billable. The “Paid” stamp now has a date on it. 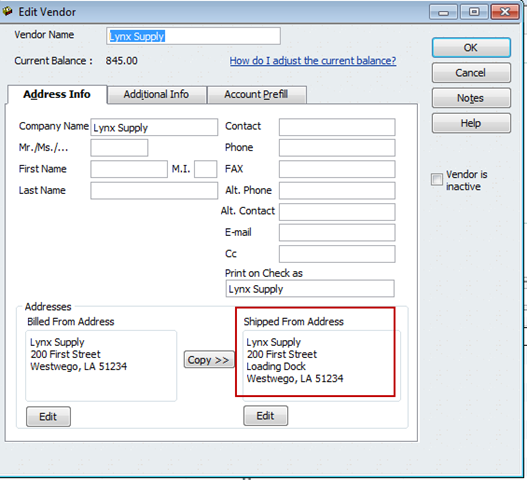 QuickBooks 2010 added the new online form design feature, which provided a small amount of convenience in applying your new design to all of your forms (invoices, sales orders, etc.). 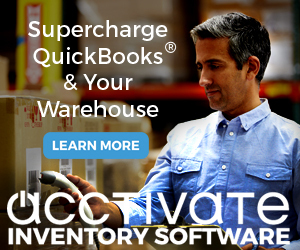 This service is changing with QuickBooks 2011. Users of QuickBooks Pro 2011, Premier 2011, Accountant 2011, and Enterprise 11.0 can try out different forms customizations and see the changes immediately online, just as before. Once the changes are applied to selected QuickBooks forms, you will have 30 days to make further edits online or apply the design to other forms at no charge. QuickBooks has a preference that lets the date on a check change when you print the check. Normally this makes sense – when you print a check you want the current date to be updated. However, in prior releases of QuickBooks this would occur even if the check had been cleared. For most people, this isn’t an issue, as you won’t reprint cleared checks. In some businesses you may do this for archival purposes (printing on plain paper). This is changed in QuickBooks 2011 to have the data automatically changed only if the check has not been cleared. 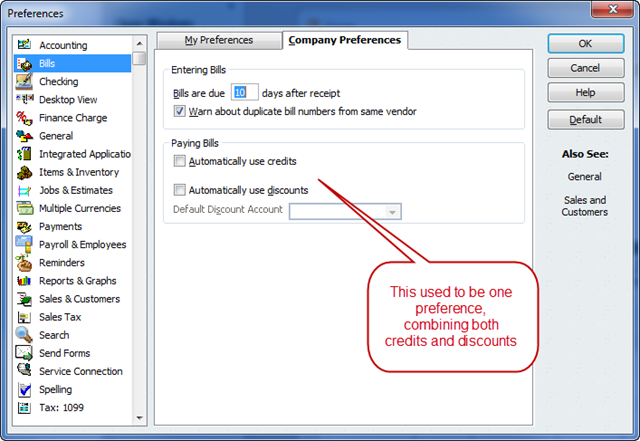 In prior versions there was one Paying Bills preference that applied to both credits and discounts. 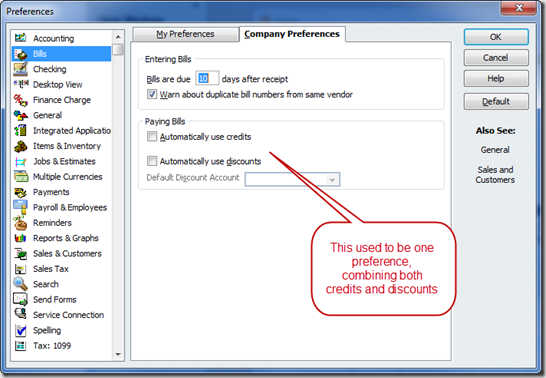 In QuickBooks 2011 these have been split into two separate settings. This provides you with greater control over what kinds of transactions will be applied automatically. This is a small change, in that it is just one check box, but it has a large impact for some businesses. When you set a closing date, you are restricted from making changes to transactions prior to that date. 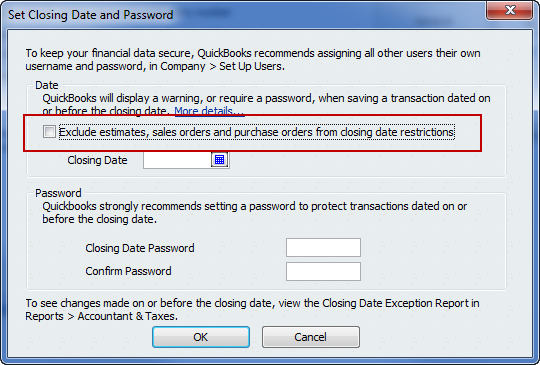 With QuickBooks 2011 they have added an option to exclude certain non-posting transactions from this restriction. This can be a big help for many businesses. You may want to stop changes to financial transactions prior to the closing date, but you could still have open sales orders, estimates or PO’s that you have to work with. This option opens that up for you. The Client Data Review (CDR) is a feature of the Accountant’s Edition that helps the accountant (you can also use it for your own company) to find and resolve issues in the company file. 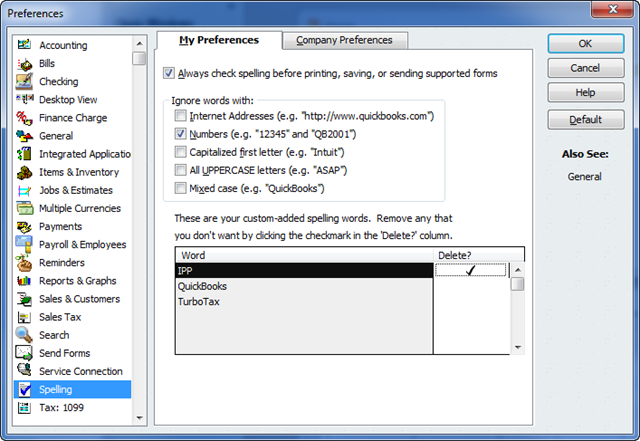 With QuickBooks 2011 you now can use this feature in multiuser mode, while other users are working with the file. Note that only one user can be using CDR at a time. Have you found any other small, unannounced changes? If so, let me know! Thank you for your excellent insights and suggestions. This company is very small but sometimes there are situations in our business that are very hard to adapt to QB’s very rigid set up. Your postings help to understand things that weren’t mentioned in our very basic QB training and also point out options we have available that we weren’t aware of in Enterprise. Charlie, regarding the mention of the COGS accounts on checks being able to be marked as Billable. It would be nice to have a preference setting that would allow it to default to blank (not billable) as opposed to currently defaulting to Billable and having to turn it off it you don’t use that feature. Thanks for the pointers to the new featrures. In our region, Australia/NZ the version is 2010/2011. Recently we upgraded. Still looking for better support for multi-currency. Doesn’t handle more than one foreign currency for items. Also it would be an improvement to efficiency if you could clone items to make it easier to add items that were close to existing ones. Just change the item name/number and edit descriptions rather than having to enter all the data again. Greame, I focus on the US edition, and all of this is from the latest US edition. The Australian/NZ version always lags behind the US edition (as do the Canadian and UK versions). In YOUR situation it is worse – the local company gets the source code and then makes their own changes, so you often don’t get some features, and get different features, than we do here. It makes it very hard for an addon software developer to work with the Australian version. Thanks for all the hard work. Pardon if you have addressed this already but is the new quickbooks search up and running in the new Enterprise 11 version? I saw your article on it in September but saw you mention it was a possible beta feature. My company is using Enterprise 10 with Google search enabled on all 8 machines. We love this feature even with its faults. Can you still enable “Google” search in 11? Is the new search as good or better than the old Google one? Your insights are much appreciated!! Kevin, all of the features that I have listed in my articles are available in the appropriate version of QuickBooks (Pro, Premier or Enterprise). There may be some minor variations in some cases (none come to mind right now). So the search feature is there. I like it very much. I hated the Google implementation because it had a significant affect on the performance of my computer, so I removed it after I tested it. I don’t know if the Google search feature is available in QB 2011 – I haven’t looked into that. The new search is different – I think it is better, but that may be something that there is a disagreement over. The new feature is very guided, Google was more free-form. i just found your site. thank you!! I recently installed QB 2010 on my new 64 bit system and definitely had all the problems associated with the .pdf feature, QB just stops responding when trying to email billing or reconcile, etc. But, I also had trouble trying to restore my backup files to this new computer. with a QB tech, we moved everything to the desktop and that seemed to work (they know there is some problem because another friend had the exact same problem and solution). Do you know of this known previous problem and was it resolved in QB 2011? Tracey – the PDF issue is resolved. As far as restoring backups, I can’t say. I use QB 2010 and QB 2011 on my Windows 7 64 bit system, and I have never had a problem with restoring backups in either case. Another interesting but, for me at least, annoying change is the way QB11 is handling inventory adjustments. In QB10 and before, when you clicked on “Adjust Quantity/Value on Hand” your entire inventory (active and inactive) would appear and you could adjust one or many. Now you are first given the option to change a single item or, if you need to change multiple items you click on the “multiple” button. Then you have to select what you want to change before you can change it. When I tried to load all the items to make many changes, it chugged for about 30 minutes and I gave up. I suspect I will need to select a category at a time and try to do make adjustments. This is going to very time consuming when keying year end physical inventory adjustments. I’m curious if you know why they made this change and if you have a better work around. It is interesting to hear your comments. My view on this was that this was a great improvement. With most of my clients, with large item lists, the old way was almost unusable because you couldn’t search the list. You had to scroll to find an item, and they sorted by “type” so parts and assemblies were separate. It was a royal pain to use. You don’t have to use the “multiple” button, you just start typing the part ID and it will locate the item. I’ve not run into the issue with the 30 minute delay – how big is your item list? I would suggest considering a “rebuild” of your data, as it sounds like perhaps you have some damage in the company file to cause that kind of issue. But that is just a guess. Charlie : Where is the list of tips to follow when upgrading versions? Jerry, I’m not sure I’ve actually published an article on that. Best short answer: Make a backup with your ORIGINAL program before upgrading. In fact, if you are upgrading from a version more than a year old, do a Rebuild of the file with the old program before upgrading, to make sure the file is cleaned up. Then when you install the upgrade make sure you do NOT install it over top of the old one (install to a new folder) so that you have both versions. And, pick a time when you can afford to be out of service for a day or so in case you run into problems (like, don’t do it when you have a payroll ready to process, etc.). This is a quick answer – is a more comprehensive answer something the people would like to see? Great site. I have the same question as Michael on 10/26. Is there a way to change the preferences and turn off the billable feature of a COGS account so it goes back to how it used to be in QB 2009? None of our COGS accounts are billable and it would be great for the default to be non-billable rather than remembering to turn it off each time. I am having the hardest time finding an answer to this questions. 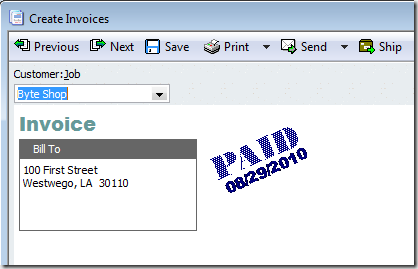 In Quickbooks 2011 I need to design a form and apply it across all of my templates. The problem is that the online designer only leta you choose a background and add a logo. I need to be able to move the componets around like in form designer as we center our company name and tag line etc. Where can i do that or how can i upload a form desaign i made in templates? Amy, I haven’t used the form design function very often, but my understanding is that first you design the overall appearance of the form in the form design function, then you “apply” it to your templates in QuickBooks. 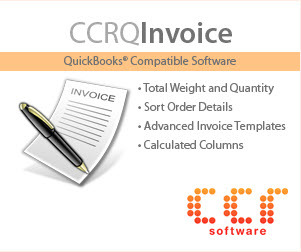 Then you can go into each individual form in QuickBooks and move things around. Several ways – select “lists” then “templates” and you can edit the forms from that list. Is it possible to insert a time stamp or date stamp on QB forms, specifically purchase orders. We have many revisions and it’s difficult to tell which is the most current. You can add a “custom field” and enter that info manually, Karen. I just updated from ’09 to ’11. Had some help from an expert but there are a lot of loose ends that I am trying to figure out. She did the back-up, which I can refer to. Now, in the ’11 version, my 126 customers all have a – 0 – balance. I hope to get this squared away before Sept 30 when I have to do my next billing. Some owe money, some have paid in advance (a flat monthly water bill). If I just create an invoice, and then add the credits and debits, it will mess up my “banking” so I am afraid to do anything until I know what I’m doing. I think she zeroed the customers out because in my ’09 version I had two different billing accounts co-mingled, so her intent was to separate the two. I have managed to input all the proper “credits” without affecting banking, so today will try to do the ones who owe money, which is more time consuming as I also have to create invoices for them. Just was hoping for some tips on the right steps to do that. Sherry, I’m sorry, I’d have to have a lot more information about what was done specifically. Have you talked to the original person who prepared this for you? If the customer has a credit put it in as a credit invoice if the customer owes money put it in as an invoice. If they have a credit for both accounts then you would make one for the water and one for the home. This should not be done by an export/import. This has to be done manual. What is the proper way to restore files from a USB disk to a multi-user system? When I restore to one station it doesn’t restore the other 2 computers on the network.